64 feet and 80 feet. Extreme Duty. No maintenance. These five-plex rollers contour like never before, allowing you to cover a lot of ground, worry-free. 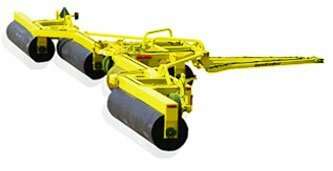 Degelman landrollers are some of the heaviest, most reliable, available. Ideally used for peas, beans and lentils, they also prepare the perfect bed for haying, grasses and silage. Degelman landrollers not only decrease downtime and fuel costs, they also provide optimal seed to soil contact while reducing weeds and moisture loss. Level land allows cutter bars to safely access the base of plants without the risk of rock ingestion. This allows for a faster, safer and easier harvest which ultimately translates to a increased yields on pulse crops such as beans and cereals. Heavy Duty. Built to Last. The rigid frame is made out of eight inch structural tubing. The drums are manufactured from 36 inch diameter pipe with over-sized shafts and bearings. Extra heavy duty cross joints and high quality cylinders and bearings are just a few of the standard features incorporated into this machine. At 12 x 8 inches, the oversized HSST tubing offers maximun support throughout the entire length of each roller. Extreme Heavy Duty, No Maintenance Bearings. These extreme duty, double-row, spherical bearings are proven through years of performance in applications ranging from marine to mining. The sturdy one-piece flange unit and bearing insert is completely assembled, sealed and lubricated in clean factory environments. The phosphate coated insert bearing provides excellent corrosion protection. Single lip contact seals mounted in the outer ring of the bearing ensure superior sealing under contaminated conditions and allow higher misalignment capability. For twenty years Degelman has produced 36” diameter drums for a reason. They work and are the ideal diameter for rolling resistance, packing pressure and strength. Bigger isn’t always better. A smaller drum is stronger when you are pounding rocks down and provides 5% more packing pressure than a 42” drum. The 6x6” HSST wrap around frame is also that much stronger. One more reason why Degelman is the most popular roller on the market. The unique “floating hitch” system provides the LR8000 series with more flexibility while in the field position. The hydraulic cylinders set on “float” allow the roller to move freely over rough terrain without being restricted by the hitch. Whether rolling a freshly drilled or well established crop the benefits are immense. Rolling consolidates the soil around the young seed which helps make moisture and nutrients more available to the young plant. Degelman Landrollers push down rocks, breakdown residue and level the ground for harvest, and subsequently reduce grain and yield losses. Rolling makes combining beans faster and easier, and there is less chance of picking up rocks or corn root clumps which can damage guards, sickle sections or expensive internal combine parts. Degelman pioneered the swept back trailing wing auto-fold concept, keeping it safe and easy to use. The least experienced operator on the farm can roll with confidence, positioning the machine from transport to field ready from the tractor seat. . The ease of transporting this roller from working width to a transport width of 14 feet (without operators needing to leave the tractor cab) makes it the safest in transport of any land roller available.